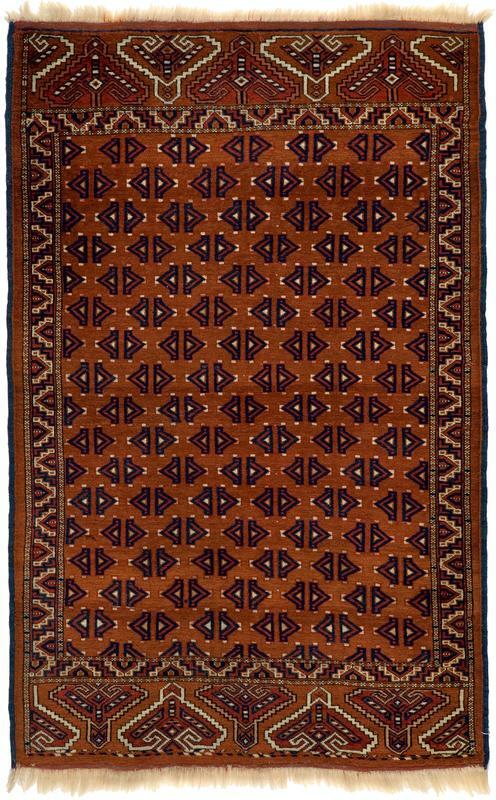 Yomud - 3' 1" x 4' 8"
Although some might see this simply as a small rug, its dimensions and design distinguish it as a Yomud ‘Ensi’ or door rug which hung in the entrance to the traditional Turkoman tent or ‘yurt.’ Turkoman Ensis tend to have a cruciform, four-part layout reminiscent of a paneled door, although more rarely, Yomud examples like this have an un-paneled allover field design. The addorsed V-motifs staggered across the field are classic staples of the Yomud Ensi, as are the large, elaborate palmette motifs in the broad end panels or ‘elems’ at the upper and lower edges of the rug. The border of serrated V-motifs is actually a highly stylized vinescroll of Yomud type. The lovely mahogany and wine tones with ivory and black accents or outlines represent the Turkoman color aesthetic at its best. One must see the actual piece to appreciate the silken, lustrous quality of the wool pile.